I’m optimistic about many things in gaming, but I’m a confirmed Amiibo skeptic. I fear the day a Zelda dungeon or Smash Bros. character is locked out for those who didn’t purchase the right $13 Amiibo figure. 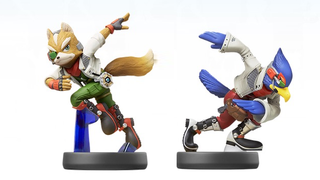 Well, at least I don’t need to fret about the new Star Fox’s use of Amiibos. “In terms of what I’m doing with Star Fox, I’m really not thinking about there being locked content or there being a mode that you won’t be able to play if you don’t have one,” Shigeru Miyamoto, Nintendo’s top game designer, told me last week at E3. I’d just been telling him about my Amiibo concerns, concerns I’d expressed in an article last May. I see Nintendo selling millions of Amiibo and then tying Amiibo to various content unlocks in games—special challenge map variations in Splatoon, or a cool weapon in Hyrule Warriors, for example—and I wonder just how far Nintendo will go in terms of treating Amiibo as $13 keys for unlocking content on a disc. Physical DLC, as it were. What I knew before talking through this with Miyamoto is that this fall’s Star Fox Zero for the Wii U will connect at least with the existing Fox McCloud Amiibo and the forthcoming Falco one. It’s logical, in that both characters who are featured in Smash Bros. and are therefore destined to have Amiibo to fill out the Smash Amiibo line-up are major characters in Star Fox. What do you all think? I know Miyamoto was just talking about Amiibo implementation in Star Fox Zero, but I think if that approach was Nintendo’s approach across the board for games that aren’t entirely based on Amiibo (like the new Animal Crossing spin-offs), I would’t cry foul. You?